This guide should help you figure out what to do wherever you are on the ice! Want to download or print? Can you please provide a pdf of the kid friendly version? I’ve just replaced the first one altogether and added a new pdf download. Thanks, I am going to put it up on my poster board, great help! If I hang it up it will hopefully remember most of it. This is such a great sheet, love it, love it, love it! What you both are doing for “How to Hockey” is really fantastic for everyone who loves the great game of hockey! I’ve wanted to play all my life and never had the opportunity to play. Well, I just turned 40 a few days ago and this has been my first full year of ice hockey! The bond between a group of guys (or kids for that matter) that gather simply for the love of the sport is something that you just have to experience! What you have taught me over your website is unbelievable! I couldn’t even stop properly on my skates! Your video tutorial on ” How to Hockey Stop” brought my game to the next level. It just kept going from there! The teams I play on are full of guys who really know the game well and love to teach it so when I study your tutorials and then hit practice or hit the rink for game time, it all starts to fall into place! Practice, practice, practice but you still need a great coach, you guys are it! By the way, I’m 6th on my team for points ( 24 games, 11 goals and 13 assists!). Next thing I know is I’m skating with a power skating coach, studying your site every night and the game just gets better and better. Keep up the great work! This is time consuming but your commitment is inspiring, way to show kids today that it’s all still about good old fashioned hard work and dedication! Can’t wait to see what you have to teach me about off season training! Dig deep, go hard! Wingers rule! This would make a great poster! Great sheet, my 5 year old wants it on his wall like a poster LOVE IT! Absolutely perfect! 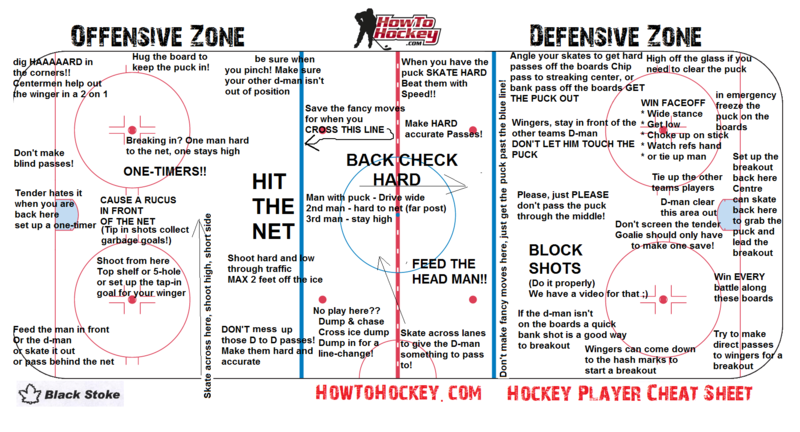 I LOVE the ‘Hockey Player Cheat Sheet’. It says all the right things in all the right places. The true test was when it was given to my 13 year old son (Minor Bantam) who immediately sat down, turned on a light, and read it over thoroughly and laughed and said ‘ya…definately…that’s for sure…hey this is really good!’. It is perfect for teenagers who are too keen on listening to advice anymore. Especially good for thos with a lot of hockey experience who have developed habits that might not support the skills mentioned on the handout. A great reminder of what to do where when on the ice! Thanks for sharing this terrific teaching tool! Nice sheet! Everything I wanted to say to my team on one piece of paper! Great layout, but I want to use this with my mite and squirt kids. The minor swearing maybe be effective with a high school or adult group but makes this useless for my teams. Thanks for the feedback Tony, just added a kid friendly version. Great job on this sheet! I really like this sheet. Works well.